Chuck E. Cheese launched a new commercial titled “Soccer” as part of their Joke from Pasqually ad campaign. The spot, 1-minute-and-58-second-long, starts with a short song with the lyrics “It’s time for a joke, a joke from Pasqually”. 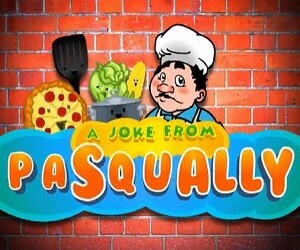 Pasqually, a black-haired puppet, with black mustache, comes in and starts the show: “It’s the time for more jokes from a me, Pasqually. Ok, here we go. What do you get when you put a radio in the refrigerator?”. “You give up?”, he asks immediately after, telling then the answer: “Cool music”, which makes him laugh out loud. “Ok, ok, I have another one for you. What is a frog’s favorite sport? Any guesses? Croaket. Do you get it? Frog’s sport. They like to play croaket. Hahahaha. Ok, I got one more for you today. What is a soccer ball’s favorite assault? You gotta love this one. You give up? I get a kit out of you”. His laugh is interrupted by an attack with balls from the audience. The spot ends with the chain’s slogan: “Fun everyday. No Joke! Chuck E. Cheese’s. Where a Kid Can Be A Kid”.